At 9:30 this morning I was at the church kitchen, tossing together my “secret” ingredients for a baked bean dish to serve 75 members of the Ankeny family who would gather for a lunch before their dad’s/uncle’s/husband’s/granddad’s memorial service. I do this as part of my job, but also because it’s joyfully satisfying to serve families in our church who have lost a loved one. 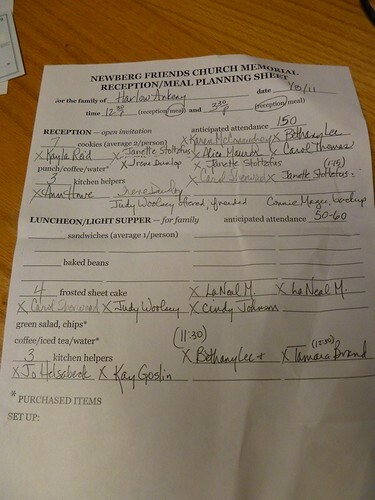 I will never forget the efforts of my (Michigan) church family in 1993, who similarly served me and my family after Paul’s memorial service. 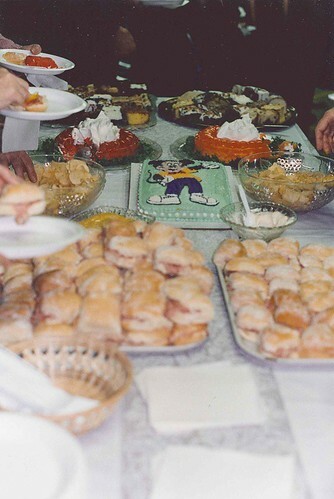 They even made a special Mickey Mouse cake to honor Paul’s collection (he always wore a Mickey Mouse watch). 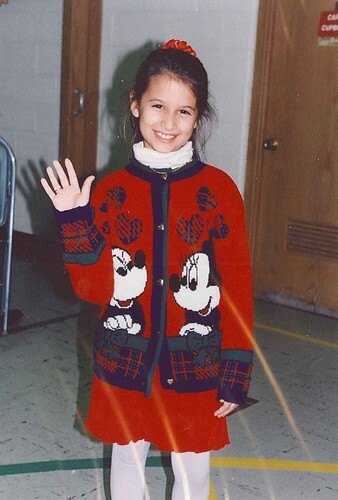 Young Dionna wore her Mickey sweater for the same reason. So you can see, it was an important part of our healing process. I don’t remember who was involved, but I sure remember the care it represented. Here’s my worksheet for the day. 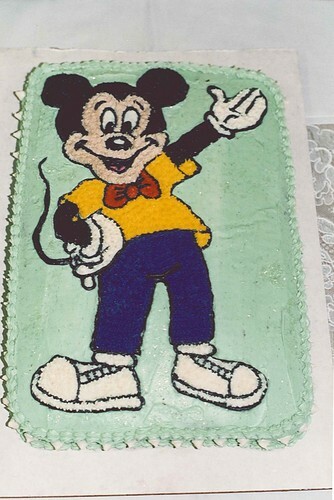 There were cookie/brownie bakers and cake bakers and those who volunteered as the lunch team and others for the reception team to set up / serve / clean up. Oh, how I love the camaraderie of a team effort! The tables got set, the beans got baked, the salad got tossed, the chips got bowled, the sandwiches got plated, the drinks got poured, the cakes got sliced, and the guests got fed. 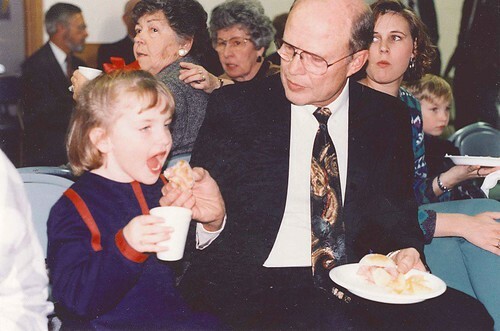 And later the cookies got arranged, the punch got made, and the family had a pleasing environment in which to visit with those who attended the service. It was a sight to behold! Who wouldn’t love my job? And I am fully blessed by it all.